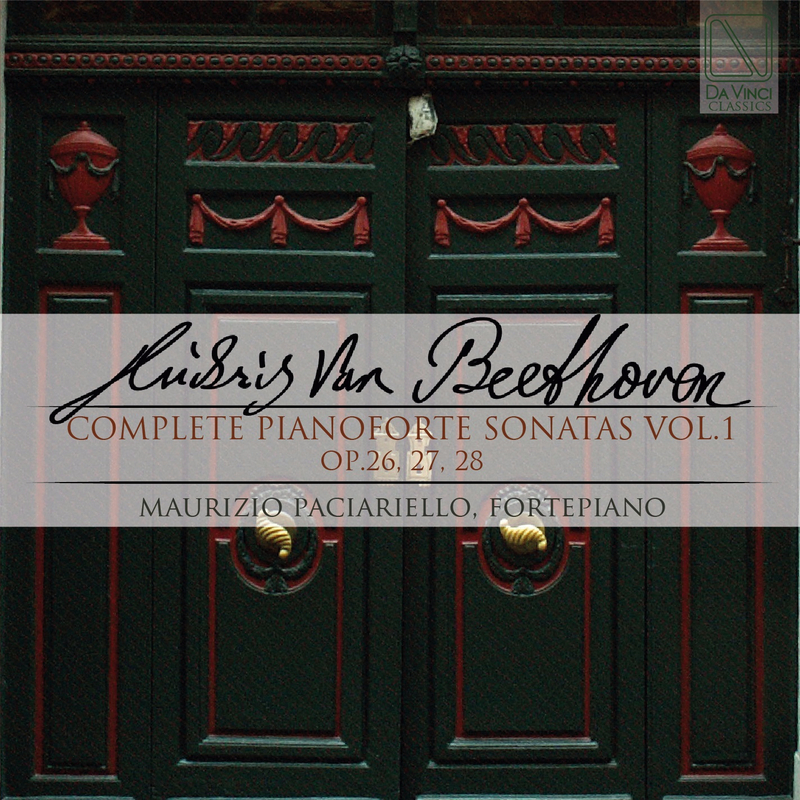 The four sonatas in chronological order Op.26, Op.27 n.1 & 2 and Op.28 presented in this CD were all composed in 1801 during the transition to the so-called Beethoven’s Second compositional period. After composing his first 13 sonatas, Beethoven wrote to Wenzel Krumpholz “From now on, I’m going to take a new path” and this turning point is clear in the sonatas of this period being very different from the earlier ones as Beethoven began to use new materials and concepts. His experimentations and modifications of the codified forms of Viennese classicism became more daring, as did the depth of expression. He began abandoning Haydn and Mozart’s common sonata form and replaced it with new ways of composing a keyboard sonata until the point he had to name the couple in Op.27 “Sonata quasi una fantasia” (Sonata almost a fantasy) to mark the distance from the traditional structures. It is no coincidence that most of the sonatas of the Romantic period were strongly influenced by Beethoven. The Op.26 opens this new trend of far-reaching experimental works. Paciariello, Maurizio (Fortepianist) attended Giuseppe Scotese’s classes at the “S. Cecilia” Conservatoire in Rome, where he got his diploma with top marks and distinction. Later, he took a higher studies course under Aldo Ciccolini. Then he completed further studies in chamber music with P. Badura-Skoda at the Accademia Chigiana in Siena, and with N. Brainin at the “Scuola di Musica di Fiesole“. He received a prize at the 47th ARD International Competition in Munich in 1998, and debuted at the Carnegie Hall, New York, in 2003. His focus is the solo and ensemble repertoire, with special interest in performing on period instruments; in fact he currently has access to a small but representative selection of period instruments, including a copy of a late 18th century clavichord, an early 19th century Viennese Haselmann fortepiano, a Boisselot French piano from ca. 1840, and a 1885 Bosendorfer. His attention to early performance techniques has led to the realization of ambitious projects, such as a performance of Beethoven’s complete sonatas for violin and pianoforte on a 1804 Broadwood piano (Museum of the American Piano, New York), and his successful performance at the Cappella Paolina at the Quirinale in Rome. His recording debut came with the Concertos for pianoforte and orchestra by F. Kuhlau and F. Berwald with the Sassari Symphonic Orchestra, for Inedita. Also for Inedita he recorded Beethoven’s Concerto in E-flat major WoO 4 (1784), winning acclaim among critics in Italy and internationally. He followed up on his research into Beethoven’s youthful concertos with the Rondo in B-flat major and the Concerto in D op.61a, both greeted enthusiastically by international musicologists and a candidate for the Prix International du Disque, Cannes. The seventh volume of “Beethoven Rarities” (INEDITA), dedicated to a revision of Concerto op.58 in the 1808 manuscript version, and Concerto op.19 with the handwritten cadenza taken from the Kafka Skizzenbuch, earning 5 stars from Rivista Musica. He produced a CD dedicated to music for violin and pianoforte by the Norwegian composer C. Sinding (ASV), which won praise from Fanfare, BBC News, Guardian, Daily Telegraph. He has recorded the Sonatas of Lino Liviabella and Nino Rota for viola and Pianoforte with Luca Sanzò, and the complete works for violin and pianoforte by Ottorino Respighi, with Marco Rogliano (TACTUS). The CD (BRILLIANT) with Luca Sanzò of Viola and Piano sonatas by Paul Hindemith has received important recognition from Gramophone, Fanfare, MusicWeb International, Musica, Opusklassiek. In his review on Fanfare of the Three Hindemith’s Piano Sonatas (BRILLIANT) James H. North so describes Paciariello’s features: “a Gustav Leonhardt turned into a Van Cliburn”.